Located on the Iberian Peninsula in the south of Spain, Andalucia is a diverse region surrounded by the Mediterranean and Atlantic coastline. With towns that sit on hilltops, picturesque landscapes and rich history — Andalucia is a fusion of culture, art and mountainscape waiting to be explored. 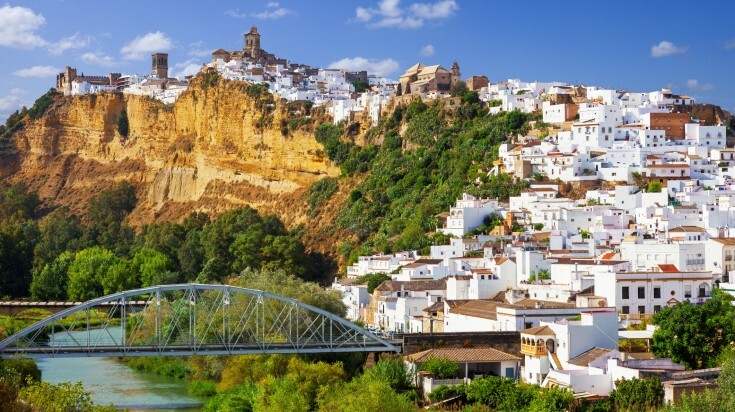 Here is a guide to traveling the mesmerizing region of Andalucia next time you’re there. Andalucia rests in between the Subbaetic and Penibaetic mountains in southern Spain. The region is divided into the eight provinces of Almeria, Cadiz, Cordoba, Granada, Huelva, Jaen, Malaga and its capital city of Seville. It is the second largest region in Spain and boasts a distinctive culture and Spanish identity. The capital of Andalucia, Seville is surrounded by gothic cathedrals and an eclectic mix of Mudejar palaces and baroque churches. The winding medieval paths bring light to the city’s aristocratic Moorish past, where flamenco dance halls encompass the city. Flamenco is in Seville’s blood and is the very fabric of life in the capital city. Seville is home to unique flamenco tablaos, where each venue offers a different take on the intimate dance. The city is known for its timeless fusion of traditional tapas to modern twists of Spain’s famous dining pastime you don’t want to miss. Seville houses over 20 different mercados de abastos (local food markets) making it the perfect way to spend a morning trying all the food that the city has to offer. Seville is notorious for being a closed-off culture where social circles are deeply rooted and it’s difficult to be part of the local community. Good to know: Seville’s sunny temperament makes siestas extra popular here. Many shops and neighborhood markets close between 14:00 to 17:00. Most stores are closed on Sunday. Resting on top of a rocky limestone ridge, with whitewashed houses that overlook the Guadalete river below is Arcos de La Frontera. Renowned for its exceptional architecture, the white hill town holds a long history with many Moor and Christian roots still visible in all corners of the city. Moorish castles stand alongside Christian churches as a reminder of the Reconquista — when Christian forces reclaimed Arcos from the Muslim Moors. Trek to Ronda through Sierra de Grazalema Natural Park, famous for its lush and mountainous scenery. Arcos de la Frontera is home to Santa Maria de la Asuncion, an architectural marvel with, a Renaissance retablo and choir that is a must-see for architecture lovers. Arcos de la Frontera is small and can be toured in a matter of hours so don’t expect a day trip when exploring this white hill town. Good to know: Arcos de La Frontera is part of a series of white hill towns on the Route of Pueblos Blancos. The route is dotted along the stunning white houses. Give yourself three days to explore the whole route. On the foot of Sierra Nevada rests Granada, a city that celebrates both its Moorish pasts and Andalusian roots. 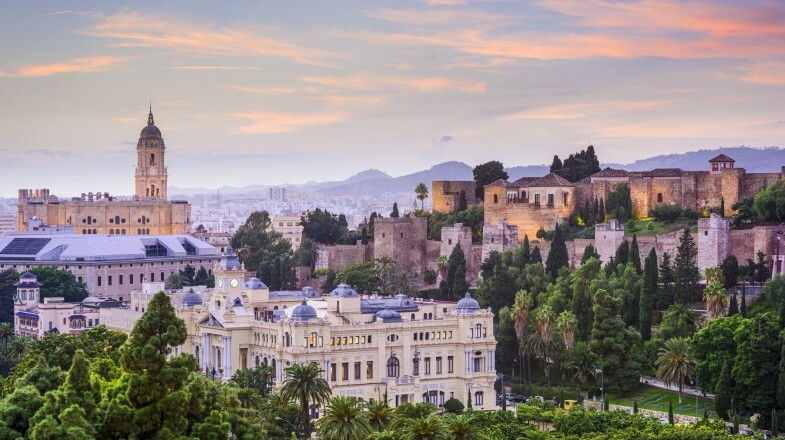 Granada’s beautiful blend of Andalusian Islamic architecture makes this city a southern gem. The city’s multicultural heritage and history can be explored through the cobblestone paths of this Andalusian jewel. 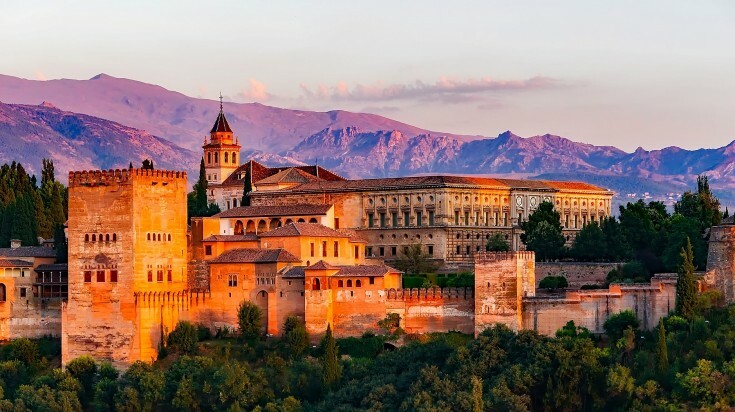 Alhambra is the only Arab palace in all of Europe and the largest monument in Spain known for its exquisite Islamic architecture is a must visit for all travelers. Take a tour of the Albayzin Quarter in Granada, a city within a city, and journey through Granada’s Muslim roots. Granada has become a tourist hotspot and is best visited in the fall months of September to October. Good to know: The best lookout to see all of Granada is in Alhambra at the Tower of Candles. To reach the peak of the tower requires lots of walking so make sure you bring comfortable shoes. Known for its sherry, horses, flamenco and aristocratic past — Jerez de la Frontera is a town in the Cadiz that has long been hailed as Spain’s winemaking jewel. The capital of Andalusian horse culture, the town dates back to the Moorish era. Many of the streets and buildings are heavily influenced by Muslim architecture with wide streets, Moorish fortresses, and jacaranda trees that sit in rows around the city center. Take a guided tour of the many Jerez wine cellars and go sampling the famous sherry selection Jerez is known for. Stroll around the Royal Andalusian School of Equestrian Art to learn more about the horses in Jerez and watch dancing horses put on a show twice a week. With festivals happening all year round, Jerez can get busy so finding accommodations can be a challenge if you don’t plan ahead. Good to know: Visit Jerez during their celebration of harvest in September where the city holds their yearly Jerez Sherry Festival to welcome in the grape harvest. Bridging Arcos de la Frontera to Ronda to Seville is Sierra de Grazalema, Andalucia's park known for its stunning peaks, gorges, hilltop villages and mountains. Sierra de Grazalema is the wettest part of Spain and is considered a Biosphere Reserve by UNESCO. Its diverse landscape is the perfect place for outdoor adventures and those looking for that special hike to some of Spain’s greatest scenery. Go biking through one of the best trails in Sierra de Grazalema that’ll take you through Grazalema to Villaluenga del Rosario for some of the most picturesque views of southern Spain. Venture the Majaceite River trail, one of the most popular trails of Grazalema, where you’ll encounter a rich selection of trees, riverbanks and wildlife. Sierra de Grazalema is wet all year round and can be dangerous for not as experienced hikers. Visit during the drier months of May, June, September and October. Good to know: Sierra de Grazalema is made of porous limestone with an underground of tunnels and pools perfect for those interested in caving, canyoning and spelunking. At the most southern tip of Spain is Tarifa. Nestled between the crossroads of where the Mediterranean and Atlantic meet, Tarifa is a city with its own charm. The last stop before Morocco, the white-colored streets and stiff winds draw surfers, windsurfers and kite surfers from all around. Its laid-back atmosphere and North African influence make Tarifa the perfect getaway. Sitting on the Strait of Gibraltar, white pristine beaches snuggle the coast of Tarifa. Relax at the many beaches and catch a glimpse of dolphins and whales that pass through. Go kite surfing and join the community of surfers that visit Tarifa from June to August. It can get extremely busy in the summer where travelers from all around flock to Tarifa to ride the waves, so plan around it if crowds are not your thing. 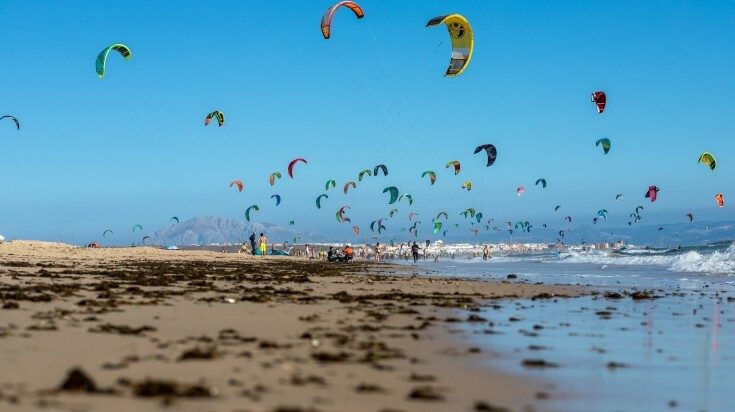 Good to know: Kitesurfing in Tarifa is difficult for beginners due to the strong waves and stiff winds. So if you’re new to kitesurfing, try your hand learning in places such as Dakhla in southern Morocco. The best time to visit Andalucia is from March to June or September to November when the temperature is cooler and pleasant. 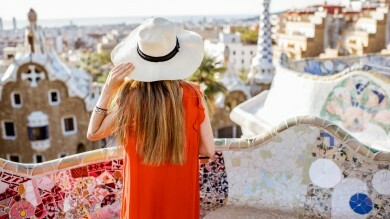 Spend at least a week in Andalucia to truly immerse yourself in all that the region has to offer, spending time in each city and exploring the history that surrounds it. Stay at least two nights in Seville. Then make your way down to Cadiz and get lost in the white hill towns. You should spend another day or two hiking and adventuring through the parks and end your time in Granada with three days to explore it all. The best way to get to Andalucia from cities such as Barcelona and Madrid would be by train. Spain offers high-speed trains (AVE) to the Andalucia region into cities such as Seville, Malaga and Cordoba. Andalucia can easily be reached from Madrid or Barcelona with direct trains into Seville. 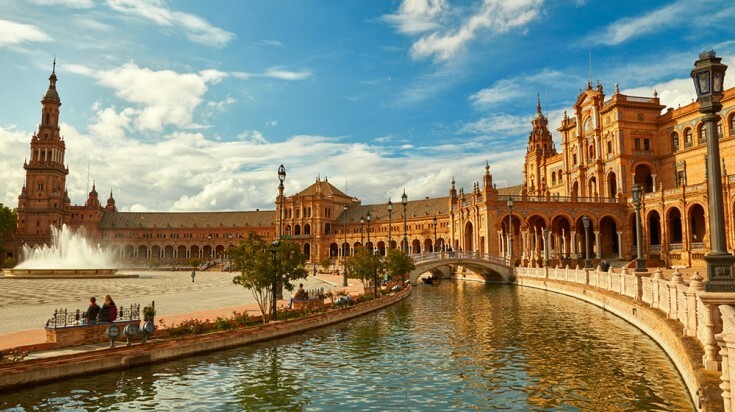 Depending on your time and budget, there are also flights from Barcelona that fly directly into Seville. Andalucia is a region infused with Spanish hospitality steeped in Moorish history. A region that dwells into a history of its own, Andalucia is where you’ll discover a beauty, richness and culture individual from the rest of Spain. To ride the waves, taste the wine, and explore Spain’s rich culture, travel to Andalucia.